Through its outstanding track record in teaching and scholarship, training for the professions and pastoral care for its students, the University has established fertile ground for its research to emerge. Indeed, the University has recently experienced considerable growth in its research capacity and capability. There are six research focus areas in ethics, philosophy, theology, catholic education, health and Indigenous studies. Research is concentrated in three research institutes, the Institute for Ethics and Society, Institute for Health Research and Nulungu Research Institute, as well as in the School and College system. With its strong identity around the Catholic Intellectual Tradition, and its established networks in healthcare, education and social services, the University has developed a solid platform of research engagement across its six focus areas. Health and medical research at The University of Notre Dame was rated as above world standard in the recent “Excellence in Research for Australia” (ERA) 2015 assessment process. The highly positive research outcomes of the Collaborative Research Network program (2013-2017) also highlighted the University’s emerging strengths in the areas of “Aboriginal Health and Well-being”, “Healthy Ageing” and “Chronic Diseases”. 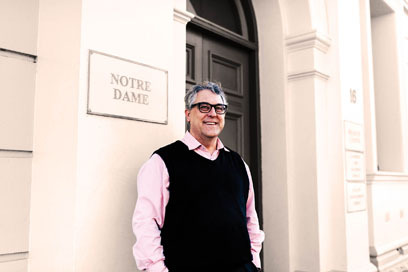 The vision and mission for research at The University of Notre Dame Australia is to develop a vibrant research culture and to conduct high quality research that makes a positive difference beyond academia, especially for those communities most in need. With a focus on training Higher Degree by Research students, opportunities are created for early career researchers to be part of societal issue driven investigations in an academic environment. As Pro Vice Chancellor Research, Professor Gregory Blatch is responsible for working with the Research Offices to develop and implement the strategic plans for research and research training, as outlined in the University Strategic Plan and associated Research Strategic Plan. Professor Blatch was previously appointed as Dean of the College of Health and Biomedicine, Victoria University (Australia). He has also held various teaching and research, leadership and management roles at the University of the Witwatersrand and Rhodes University (South Africa). He has a keen interest in the role of mentorship in the development of academic and research capability, and he has played a foundational leadership role at institutional, national and international levels in building academic and research entities.